When something as traumatic as a brain or spinal cord injury happens to someone you love, it’s not uncommon to feel overwhelmed with everything that has to get done in the immediate future. It’s not every day that you plan to be gone from your home for weeks at a time. And hospitals aren’t always known for their warm, inviting atmosphere. 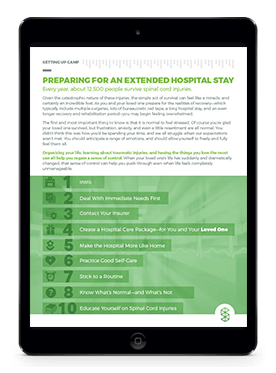 By arming yourself with this comprehensive guide to preparing for an extended stay at a hospital, you’ll ensure nothing falls through the cracks during this emotional time. Fill out the form to the right to download your free copy of the hospital preparation guide.